The spring of 2018 saw a team of academics from New Zealand and Scotland look for DNA evidence that Nessie exists. The team form the USA visited Loch Ness for the second time (last time round was in 1997) but this time came with divers. In July 2013 Charlie Sheen, the legendary Hollywood actor and star of Two and a Half Men visited Loch Ness to search for Nessie. He picked up an original clinker built wooden boat and went with his team and a local guide for two night time hunts for the monster. Allegedly, the hunt involved bespoke fishing kit (made up of a large hook and some rope), a leg of lamb and some malt whisky. Unfortunately Nessie wasn't tempted but the word is that Charlie is coming back sometime to finish the job! Sir Edward hired twenty unemployed men from the Inverness Labour Exchange and deployed them around the loch. Each was equipped with a box camera and binoculars. Under the direction of a Captain Fraser several photos were taken but after examination none proved conclusive. In connection with the film mentioned previously, Tim Dinsdale is probably the most notable of the lone man' expeditions over the years: He spent a great deal of time on and around the loch, at times in a camouflaged boat, but his film which was examined by the Joint Air Reconnaissance Intelligence Centre and deemed unexplainable proved to be his most significant find. Tim Dinsdale (mentioned above) was one of the prime movers in setting up the LNIB which had David James MP, Peter Scott, Richard Fitter and Constance Whyte as its directors. 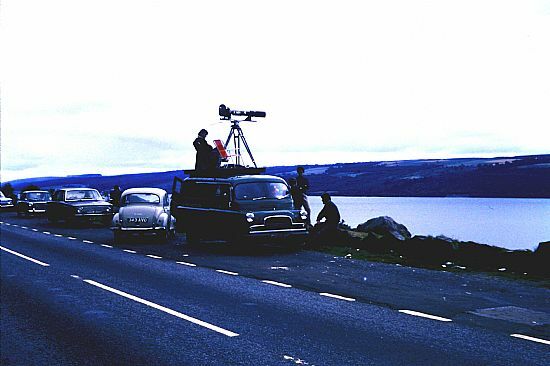 By 1964 the LNIB had a permanent base at Achnahannet in addition to camera positions around the loch. Each position had both still and movie cameras in place and were supplemented by a team of mobile camera crews who moved constantly around the loch. The Bureau used a number of other techniques including searchlights at night, airborne searches, echo sounders, hot air balloons, sonar, infra-red cameras and submarines. The most conclusive evidence produced by the LNIB was from the use of sonar which in 1962 and again in 1968 produced large strong contacts around the loch. The bureau finally closed in 1972 due to a lack of funds. Carrying on from the work of the LNIB, and under the direction of Dr. Robert Rines, the academy brought the technology of underwater photography to Loch Ness. The most prominent pictures produced by this investigation were those of the "flipper" taken deep in the loch. The project was set up to investigate Loch Ness and Loch Morar together as both have a history of monster sightings. Loch Morar is on the west coast of Scotland and is similar to Loch Ness in that it is a large inland freshwater lake. It is in fact Europe's deepest lake at over 320m deep. Unfortunately, all the results of this particular investigation were to prove inconclusive apart from some strong sonar contacts at Loch Ness. A break in formal investigations took place until 1987 when under the direction of Adrian Shine Operation Deep Scan took place. A flotilla of 24 boats scanned the loch from end to end with sonar for a number of days. The result of this was three strong contacts of which one, a large and moving object some 67m down, still remains unexplained. This was formed by UK television personality Nicholas Witchell and included Professor Colin Curds, Keeper of Zoology at the Natural History Museum amongst its council of management. In 1992 the project undertook the first complete hydrographic survey of the loch since 1903 travelling 80Okm and taking over 7,000,000 soundings. In 1993 Project Urquhart worked in conjunction with the Discovery Channel to carry out a biological survey of the loch. One result of this survey was the discovery of a previously unknown species of nematode, a tiny worm. Again during the work four very strong sonar contacts were traced in mid water that were too large to be one of the loch's known fish. Founded by Steve Feltham when he arrived at the loch from Dorset on 18 July 1991 and still going strong. Living in a converted mobile library, Steve keeps an eye out with a video camera and high powered binoculars. In doing this he hopes to capture a conclusive piece of video footage. Steve funds his research with public donations and also by selling hand crafted model nessies. He is now a well-respected member of the monster hunting community and provides a balanced viewpoint on many features of Loch Ness, most notably on the multitude of possible sightings that occur each year. To date his findings have proved inconclusive. This is the name given to the work carried out by the Official Loch Ness Monster Fan Club. Each year through the late 1990's and early 2000's the club endeavored to look at something new regarding monsters in Scotland. This included work at Lochs Morar and Lochy as well as Loch Ness. In the summer of 1997, two visits to Loch Lochy, just down the glen from Loch Ness, resulted in large unidentified contacts on sonar in addition to evidence of very deep holes in the bottom of the loch. In March 2000, the club worked with the Swedish Global Underwater Search team and recorded two unknown sounds deep in the loch. In the late 2000's Gordon undertook a series of expeditions to the loch. He recorded a number of sonar contacts and one piece of video evidence and is continuing his research.